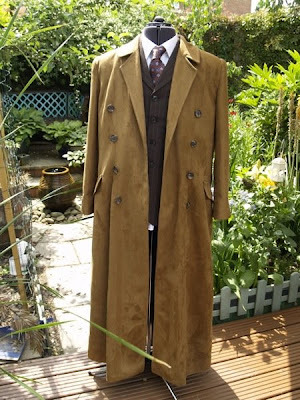 I have recently finished making a Tennant Coat for a friend, Justin Monk, who lives in Canada. 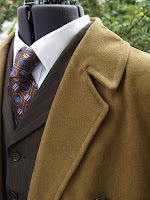 You may recall he was the subject of the first Me And My Tennant Suit, having made his current suit from the JoAnn fabric (with which I am very close to finally making my own suit). He had gone through two Tennant Coats along the way. As a footnote I mentioned he had a new one in the pipeline. Well I had that on good authority, since I was making it for him!!! Before I trusted it to the couriers I took these pictures to share with everyone. I made the coat from the Malabar fabric I used for the MkII and Mk III, as it is much more economic than the Alcantara. The colour is not match a perfect match, but it photographs looking very much like many of the publicity pictures of the real coat, so is a good substitute. The manufacturing of the fabric has recently changed (initially much to my horror) but I have found that it although it is the same weight and thickness, it now drapes a lot looser and looks even more like the real thing than it had done before. It did used to be a little stiff. This was the first time I had made a coat for any other than myself and it was interesting working to some made-to-measure dimensions other than my own. I was so used to trying my coat on at every stage and adjusting as needed, but this time fitting was with a tape measure and a tailor’s dummy. Justin is 6 ft 1 and I am only 5 ft 10, so when I did try it for size once it was finished the coat was trailing on the floor! 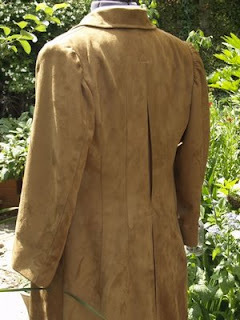 The coat has all the classic features and destinictive design the original, and my own have. For the back (see above) I needed to adjust the position of the bottom of the back vent so it sat at the right level for Justin’s frame. 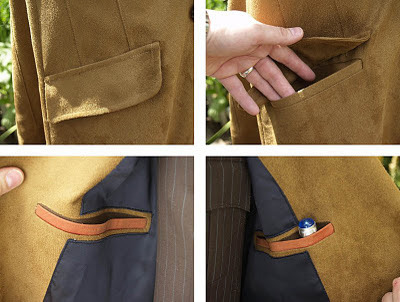 Again I did the outer pockets with the non-cognitive flap (see below, top pictures), and the inner pockets include one (see below, bottom right) which has a split width to accommodate a Sonic Screwdriver and keep it nice and upright, ready for Sonic-action! Justin is pretty happy with his new coat and plans to wear it to a number of Sci-Fi conventions in and around Canada this year. If you are attending Polaris23 on July 10th-12th 2009 or FanExpo in August 28th-30th 2009 (both in Toronto, Canada) look out for him! Any idea what type of suit that is? Is it a custom? The suit on the tailors dummy is a Magnoli suit.